Nouveau Plan de Paris Divise en Vingt Arrondissements. 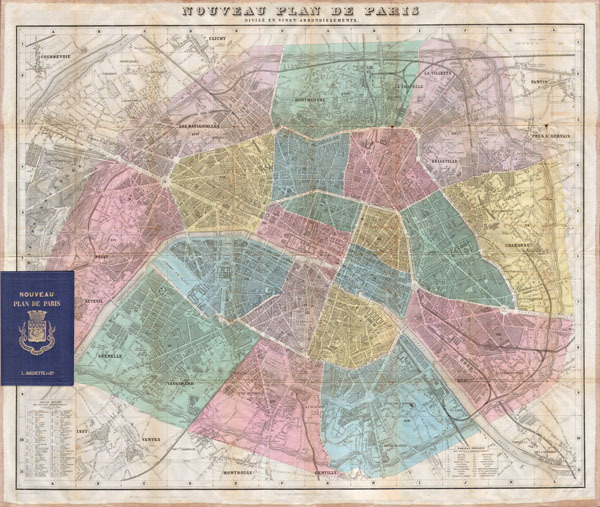 A spectacular large format linen backed folding map of Paris, France. Published by the Hachette firm in 1870. Depicts the city in extraordinary hand colored detail with all train lines, streets and major buildings depicted. Comes with booklet containing a useful street index. Published from Hachette & Company's 79 Boulevard Saint Germain office in Paris, France. Remarkably good condition. Linen backing is strong and free of splits. Minor wear on fold intersections and light toning on original folds. Linen edging intact and clean. Detached from included booklet for framing purposes.